It takes a lot of sweat and tears to get to a scenic spot like this, but what else lies behind a good landscape cinemagraph? We spoke to gallereplayer Tyler Lillico about ‘Campfire Under the Stars’, a “living photo” captured in the Canadian Rockies, just a few kilometers from where ‘The Revenant’ was shot. gallereplay: Tyler, what was the inspiration behind ‘Campfire Under the Stars’? Tyler: I had originally made plans to go out to the mountains to do a sunset hike then watch a meteor shower that was supposed to be peaking that night. While setting up camp for the evening the idea of making a cinemagraph in such a picturesque location jumped out at me. I’d never done a cinemagraph involving fire so this was also an experiment/test for me. Scenic views along the route to Tyler’s camping destination. gallereplay: How did you go about picking the spot? 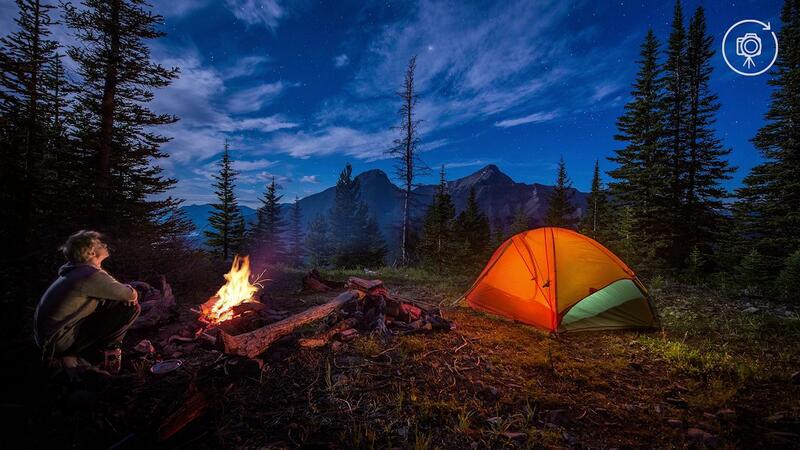 Did you immerse yourself in nature and actually spend the night “on location” in the wild? Tyler: It’s pretty hard to find a bad view in the Canadian Rockies so the only plan I had for a location was to hike high enough up a mountain to get a good view of the stars. It was a beautiful summer night so I always had the intention of spending the night. The cinemagraph idea was more of an opportunity that jumped out at me so I gave it a go. gallereplay: What was the greatest challenge you faced making this cinemagraph? Tyler: The greatest challenge was probably the hike up to this spot with all my camera gear and camping gear, that stuff is not light! Capturing all the required elements in camera to create the final cinemagraph was quite difficult as well. The settings required to shoot the fire at night vary dramatically from the those required to get a vibrant night sky. It’s kind of like a puzzle of exposures and if one piece is missing then when you go to put it together you can’t finish the puzzle. One of the photographs used for Tyler’s cinemagraph. This one is exposed for the tent. While this one is exposed for the sky (the tent is over-exposed here). gallereplay: How were you able to get the sky and the stars to look so bright without getting a noisy image? Did you use an HDR technique and shoot at different exposures? Tyler: You’re on the right track. For a shot like this where the exposures vary dramatically from a very bright fire to an extremely dark landscape you need to expose for each individual element in the photo. For this cinemagraph there are three different photos combined with a video of the fire to make the final product. I ran into the problem that exposing for the sky blew out all the details in the fire and tent so I ended up taking the sky shot once the fire was much smaller. I was also fortunate that the moon was shining quite brightly that night, and illuminated the landscape which allowed me to reduce the ISO settings on my camera keeping noise to a minimum. Tyler: It’s funny you should say that because this spot is actually only about 50km from where they filmed a lot of the movie! Lucky for me, grizzly bears are not super common in the area, although I did have bear spray and some other bear deterrents just in case. Check out Tyler Lillico’s gallereplay profile for more of his cinemagraphs!